April 21, 2018 By Elise Leave a Comment This post may contain affiliate links. Please read my disclosure policy for more info. Let’s face it, life is easier when you have a plan. Even when (and it really is when, not if) you get off track, at the very least, a plan gives you guideline, and a helping hand toward getting back on track. As a mom, homeschooling my kids, taking care of the house and small farm, plus running a small business, one of the most important plans I can have is, you guessed it, a meal plan. To understand why such a simple thing as a meal plan is so important, first you have to understand what life is like without it. Spending more on groceries because I don’t have a solid plan for what I’m buying. We talk about the absolute best way to meal plan and save money on groceries in 6 Days To Slash Your Grocery Budget, but breaking that monthly list of meals down into a weekly plan has become key for me when I’m planning my week. I have absolutely zero stress about getting breakfast, lunch, or dinner on the table every day. This week, I thought I’d share my meal plan and shopping list, because if making a plan makes life easier, imagine how cool it would be to have it done for you. All you have to do is fill out the form below to get your access code to our meal plans page! This week’s meal plan is right at the top, along with some helpful recipe links. Enjoy! P.S. 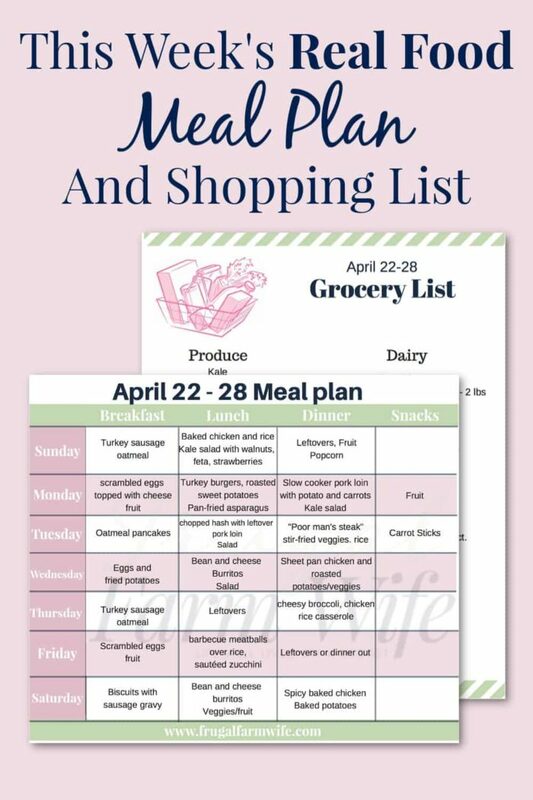 Because I’ve been asked, yes, this meal plan + shopping list is free, however, in the future (because it takes forever to put together), we will be charging for the meal plan + grocery list + recipes packet. Get The Printable Meal Plans! Enter the email where you want us to send the access codes to our free meal plan and shopping list printable library! Success! Now check your email for your link and access code! The vinaigrette brand I like is pretty expensive, so though it is listed with the groceries, I recommend maker your own, even healthier version. Ground turkey is on sale this week at Aldi, so you’ll notice that it’s on the grocery list, and that the menu calls for sausage for breakfast. I didn’t think to make a note that the turkey is for making that sausage (we like making turkey sausage a lot more than buying pork sausage – so much less greasy, and no extra, potentially yucky ingredients!) Sausage is really easy to make using our breakfast sausage recipe. The shopping list assumes you have some basics in your pantry like salt and pepper, spices, and oil for sautéing.